Home > Etc, KMS	> 10th Anniversary History! Nexon posted this video yesterday, it’s really cute and details many of the things that have been added to MapleStory! It doesn’t really tell us anything new but I wanted to show it to you guys, check past the cut for translations! 2004: Adventurers’ first steps towards the first new continent, Orbis and El Nath! And the appearance of Zakum!! 2005: Guild system update and the boss monster Papulatus, Dark Star’s appearance! Korean theme dungeon, Korean Folk Town and the beautiful underwater Aquarium! 2006: Guild competitions and the global travel system! 4th job advancement! The appearance of monsters from another dimension! Leafre update! 2007: The appearance of MapleStory’s first new job, Pirate! And another hero’s’ appearance! 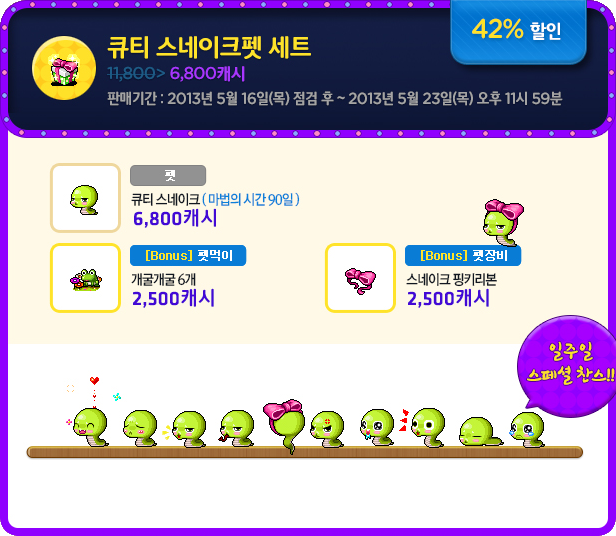 타락파워전사, the first level 200! 2008: Defend Cygnus! Knights of Cygnus update! 2009: Black Mage sealed! Five heroes’ first appearance! Aran! And Evan! 2010: The biggest change in the history of MapleStory! Level up faster and easier! Big Bang update! The movement of the counterattack! Resistance’s appearance! Black Mage’s commanders’ first appearance! Lion King Van Leon! Maple’s first two-weapon style, Dual Blade’s appearance! And everyone enters Super Fight! The ultimate enemy! Empress Cygnus unveiled! 2011: Maple Legends rise up! Cannon Shooter! Mercedes! Demon Slayer! And Phantom! 2012: Tempest! The last of the five heroes, Luminous! Nova race’s ultimate warrior, protector of the dragons, Kaiser! Idol of the battlefield, Angelic Burster! Item’s revolution! Unlimited! Demon Avenger! And Xenon! 2013: Cygnus Returns! Find the Seal Guardians! Root Abyss! An uninterrupted 10 years. Everyone showed their love and aspirations! 18 million users together for 10 years/3650 days/87,600 hours/5,256,000 minutes. We will return that enthusiasm. Let’s welcome the beginning to another 10 years! Let’s create excitement once more! Maple, the 10th Story begins now! On an unrelated note, I hope you guys have been keeping up with the news for Pokemon X and Y! I know I have, I’m so excited for this game, can’t wait until October~ They just recently released some details about the new region Karos as well as four new Pokemon! My favourite is definitely Pancham, it’s adorable, haha. This is so cool! Where is dualblade before bigbang? interesting 4th job didnt exist initially? I remember in GMS Leafre came in the same update as 4th job. 3rd job didn’t exist intially too. also what system is pokemon x and y for? Interesting… They never mentioned Mikhail. Like it has never existed. What is mikhail? Is that the one help soul master to up job? NEXON FORGOT DUEL BLADERS TOO! Like, legit. Weren’t Dual Blades released a few months before the Big Bang, or was that just in GMS? AND IT TOOK THEM 6 GENS FOR PEOPLE IN POKEMON TO LEARN TO SIT ON A BENCH! X AND Y IS EPIC!!!! heh really wish i could play KMS. the community in MSEA is so screwed. and all asiasoft want is $$. they dont care about the players. I wonder what song in this video! It’s so nice! Anyone know? Where are the skill changes from this patch? This wasn’t even a patch. Baka. I’d love to know the song that plays at 0:10! EMS got cygnus before pirates lol!